One of the first gardening books that will take you from the garden to the kitchen. 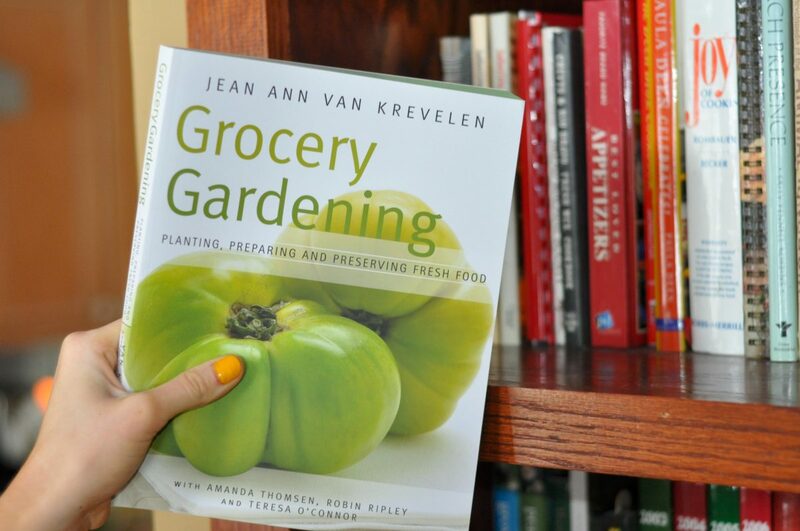 In this post I share the Grocery Gardening | Planting, Preparing and Preserving Fresh Food by Jean Ann Van Krevelen. I still remember getting the Grocery Gardening Book in the mail February 2010. I was very new to doing book reviews and what an honor to get a publication from a gal I followed (and adored on social media). When I look back on those days I didn’t realize that just about everything in that book was what I lived in my garden and home. To this day it is one of my favorite cookbooks that I have close to the kitchen for reference and inspiration. Below I share one of the recipes that stood out when I first received the book to review. 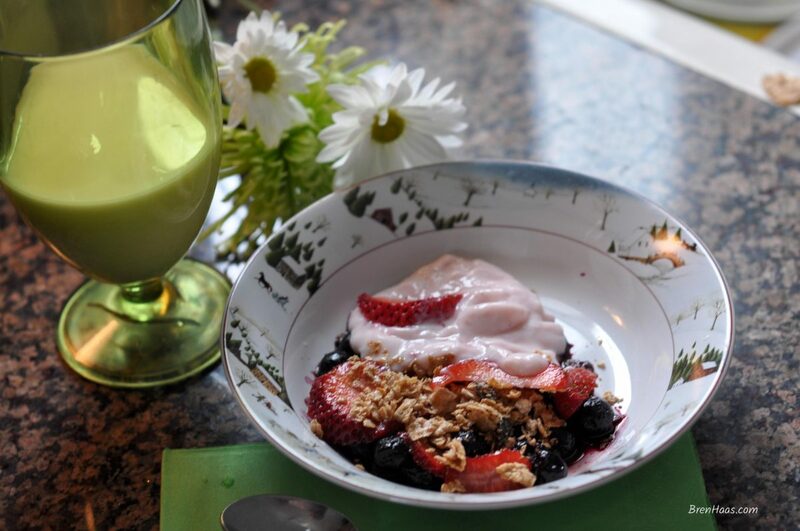 Berry Crumble recipe which was basically a recipe I use only with dark brown sugar. The recipe calls for a brambleberry which I do not grow. You can substitute the berry for your favorites as mentioned in the recipe. ENJOY! Place the berries in a large baking dish, sprinkle with sugar, salt and cornstarch evenly over the berries. IN a food processor add the flour, graham crackers, oats, brown sugar and salt before adding the butter. Pulse until the butter is incorporated and the mixture is crumble - not a dough. Spoon the steusel on top of the berries in pan. Bake 30 minutes or until the top is browned and the berry mixture is bubbly. This recipe is a spin-off of the one on page 104 of the Grocery Gardening Book. 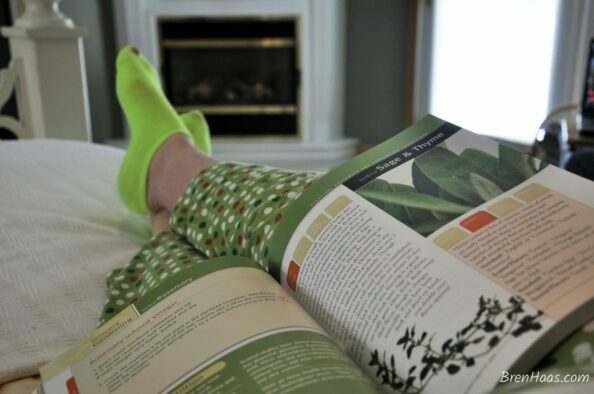 As you can see from the photo below, I am kicking back by the fireplace with my favorite green socks on reading this awesome book. I think I actually did read it from front to back because of all the neat gardening tips featured with each edible plant mentioned. 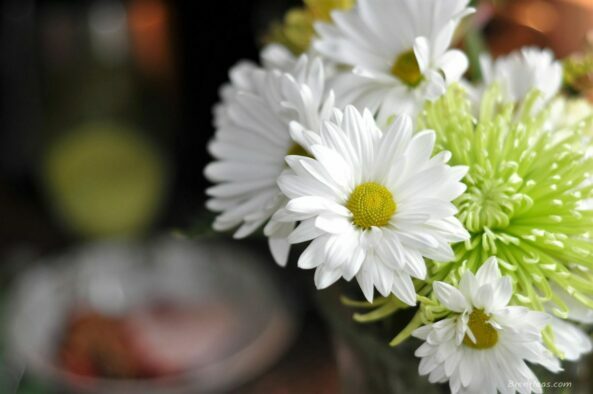 Aren’t these blooms wonderful? The bouquet was one I picked up at the grocery store just to share with this book because I liked all the green going on in the publication. I can’t remember if Pinterest was even around when this book was published. I made this image the right size for sharing on the giant search engine site! Be sure to tag me so I can follow you ( I am at @brenhaas) on Pinterest. It is always a summer day when you have a good garden book in hand. Share with me some of your favorite reads. Comment on my post or reach out to me on my contact page featured on this site. Beautiful post!!! I love the green. Everything you put on your blog is lovely. Looks like a nice escape inside your house from the blizzarding weather. The book looks nice too. I would love to participate in super sow sunday bit it’s way to early for me to be planting seeds. I can smell that Berry Crumble through the screen. You offered me a virtual delight with your gorgeous photos and enthusiastic explanation of how excited you were to use your fresh frozen fruit from last season! This was the nice break I needed today. Thanks for sharing it with me. Chinese chive flowers with shrimp is an easy dish to make and reheats well in microwave.I saw in Thailand using lot of chinese chive flowers in their apetite…nice post Brenda..
Wow. This is awesome – keep up the great work! What a wonderful article Bren, your work it outstanding. You bring a demenstion to the pages of book that are heart felt (love the footies too). I’ll be at Boarders picking up a copy tomorrow! What an addition it will make to my kitchen it will be. Hiya very nice blog!! Man .. Beautiful .. Wonderful .. I’ll bookmark your blog and take the feeds also…I’m happy to search out so many useful information right here within the post, we’d like develop more techniques on this regard, thanks for sharing. . . . . .